Here is a piece Mr. Lantern Fishworks wrote and let me use on my "Keep Prying" site. On the first day of Christmas (in 1979), my mailman gave to me the Sears 1979 Christmas Book, a.k.a. "Wish Book for the 1979 Holiday Season." I was thrilled and delighted, enraptured and excited. My brothers and I jumped for joy (and the couch as well), and I broke my personal cardinal rule for reading, usually applied to comic books: Never look at the last page first. But the Wish Book is the exception. No need to wade through pages of Men's 100% Celanese Fortrel® polyester body-hugging slacks and monogrammed Naugahyde® toilet seats when one turn of the leaf reveals a full-color display of electronic sports games on the inside back cover. From there on back, it's sheer joy for the grade school reader until about Page 399 when the scenic wall clocks kick in. My brothers and I were left with 270 pages full of contenders for coveted spots on our Christmas lists. 1. PAGE 611 (8): Incredible Hulk Instant Muscles by Remco. 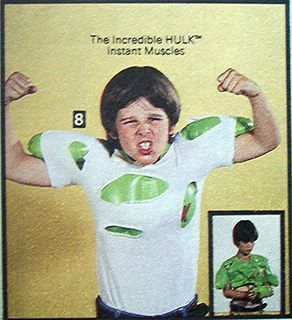 This green inflatable vinyl exoskeleton conspicuously hidden under your pre-torn undershirt (note: inflating muscles will not shred t-shirt in Hulk-like fashion) mimicked the freakishly large physique of Dr. Bruce Banner's irradiated alter-ego, The Hulk, when inflated by included pump (pump included for inflating). I did not own this; I was more of a Spider-Man fan. 2. PAGE 550 (9): Kaptain Kool Wireless Microphone. I remember loving the Kaptain Kool segment of the Krofft Supershow on Saturday mornings (I also remember loving "Bring 'Em Back Alive," so be wary of my hyperboles). I recollect very little about the program other than it featured Kaptain Kool and his band, The Kongs. Sid and Marty could sure name them, huh? Anyway, with this 9-inch, high impact plastic microphone, you too could be a Kong as your voice was transmitted from the long- range telescopic antenna into an AM radio up to 30 feet away. I suspect that's a distance dwarfing Kaptain Kool's own transmissions today. 3. PAGE 659: Zodiac, The Astrology Computer. If you didn't mind resting your fate on the potential strength of two 9-volt batteries (and a manual edited by world-famous astrologer Sydney Omarr, whose writings can be found on thousands of funny pages across the nation), this molded plastic fortuneteller was just for you! The full- page spread is peppered with exclamation marks, hugging terms such as electronic "brain" and "readings." Still, I'm sure it's more reliable than the Magic 8-Ball. 4. PAGE 447: J-Ball: "Racquetball without the walls". Regulation size racquetball connected to 12½ ft. stretch band connected to weighted, plastic anchor. Includes two aluminum racquets. And a 34 pg. illustrated rule booklet. 34 pages? Seems to me there's gotta be a lot of white space on those pages. I could've saved them the paper and printed the instructions on the ball: Hit racquetball with racquet. Repeat. I've included this item for two odd reasons: There's no indication what the "J" stands for. Also, there's a curious endorsement "by the I.R.A." Perhaps some idealistic copywriter thought a match would be a grand way to settle the Troubles. 5. PAGES 618 & 619: The STAR WARS pages. Essentially, Sears' "centerfold" for prepubescent believers in the Force. Soon Miss April would replace Boba Fett (but not before Princess Leia as Jabba's slave in "Return of the Jedi" quickened our collective pulses). Ah, who am I kidding? Nothing's ever replaced Boba Fett! Anyway, the whole pre-"Empire Strikes Back" menagerie is featured here in molded plastic and die-cast metal. Greedo, Jawas, the anonymous Death Squad Commander, and their space transports as well (Land Speeder, Tie Fighter, etc.). Is anyone even reading this anymore? Rating: THE BEST WISH BOOK PAGE EVER! 6. PAGE 597 (9): Gobbles by Kenner. This I don't remember. 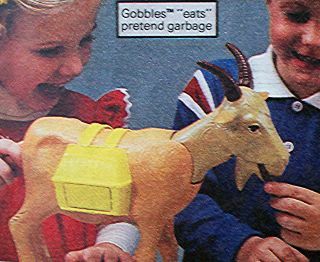 Gobbles was a plastic goat that "ate" pretend garbage. Do you know what Gobbles is now? Real garbage. Still, I do wish I had one---it made a chewing sound and "baa'd" when the basket on its back was pushed. I love a toy whose description mentions "junk" once and "garbage" twice. 7. PAGE 572 (2): Child-Size Upholstered Rocker. "This classy-looking rocker is fully upholstered in heavy-gauge leather-look vinyl." At first, I thought they were writing about Mike Reno of Loverboy. At second glance, I realized this was a description of a chair. A swell Christmas gift. "Thanks, Santa. The Russo brothers got the Tyco Super Duper Double Looper Slot Car Racing Set. Maybe if I drag my new chair up the block, they'll let me sit and watch them play." 8. PAGE 537 (5): Farrah Glamour Center. Back when she was Fawcett-Majors and married to the Six-Million Dollar Man (now THAT was Hollywood royalty), Farrah hawked her willowy image to toy companies while she was still a role model to flocks of adventure-starved schoolgirls, and a source of curious electro-chemical reactions within legions of grimy schoolboys. One marketing example was this plastic 10-inch replica of her head, showcasing her trademark mane: Apply makeup (from a compact with four colors) and dye her hair (brown, red or purple) to get the ol' girl ready for her Mike Douglas appearance. And after she's all dolled up, begin again! She's "completely washable!" But, hey, take it easy with the brown hair dye---three brunette "Angels"? Charlie would not be pleased. 9. PAGE 540 (4): Custom Van Lamp Kit. A black, orange and yellow custom van with a lamp on its roof. The shade features other custom vans. A sliding door reveals a storage compartment. What could you store in there? How about your dignity? 10. 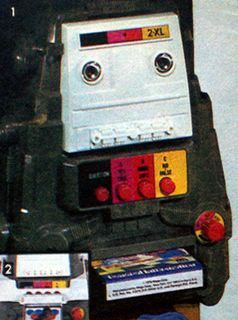 PAGE 657 (2): 2-XL: Mego's Talking Robot. "Perhaps once in a generation, a new type of family entertainment comes along unlike anything ever seen or heard before," claims the catalog description. Luckily, information and invention seem to be advancing exponentially lately. Because if progress moved at a pace relative to the advances put forth by this "Robot" whose databases were stored on 8-track tapes, twenty years of research might have only produced a "Robot" whose databases were stored on cassette tapes. 2-XL asked questions and riddles, told jokes, played music and sang songs. While I never owned this, I do have a "similar" "talking" "Robot": my TV. 11. PAGE 529: I've been hesitant to look at this page. It frightens me. Perhaps it frightens you, too. I can't see it serving any other purpose. 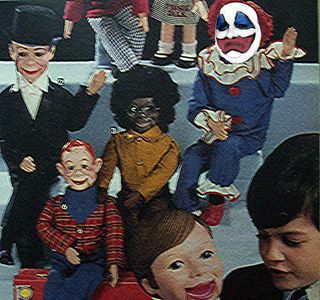 It's the Ventriloquist Dolls page. 12. PAGE 399 (5): Scenic Sun Forest Clock. I've saved the second-best for last. This scenic wall clock is constructed of a full-color photograph of a misty sun-dappled forest floor mounted on pressed cardboard, with four Arabic numerals in the corner. Yes, I've changed my mind about scenic wall clocks. I like them. If only I could find one with Boba Fett. I put down the catalog, stretch my arms and legs and stand up. I've been lying on the couch for several hours. I detect a soft scent of pine in the room as I walk towards the kitchen to look out the window. The sky is white and overcast. The air looks still and cold. I don't ask for anything for Christmas anymore. My wishes have come true. My Christmas season has begun. Thanks for your kind tip of the santa hat. Now where's my f-in' money?!? The photos really improve the piece. But for the love of Christ, please take out the Pogo pic. 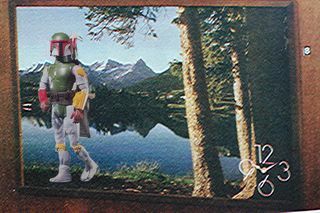 I must add, if you look at the Boba Fett scenic clock at the end, the "6" and "9" are really cool-looking. That's the seventies, baby! From The "The More Things Change..." Department.